Commuters, airline passengers, tourists in Finland to feel pinch of Trump-Putin summit. Commuting in Helsinki or flying out of the capital could mean longer queues and extra security during the Trump-Putin summit. Hotel prices may also spike. Image: Jaani Lampinen / Yle. On Thursday, daily Helsingin Sanomat reported that US President Donald Trump is expected to arrive in Helsinki on 15 July, one day before planned bilateral meetings with Russian counterpart Vladimir Putin. 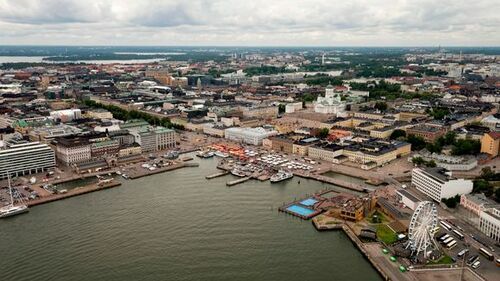 Helsinki City official Leila Oravisto told Yle's Swedish-language service that it is difficult to determine how the high-level meeting will affect traffic in the city on 15-16 July. She cautioned commuters and motorists in the city to brace for special traffic arrangements. “If you are going to the airport, you should get on the road in good time,” she added, noting that it would probably be best to avoid venturing out into traffic during the summit, especially by car. Furthermore, Helsinki police said on Wednesday that the department had received notice from four groups of their intention to stage demonstrations during the visits. On Wednesday, Finland’s Foreign Ministry announced that Finlandia Hall would serve as a media centre for international press, of whom some 2,000 representatives are expected to descend on Helsinki for the summit. In general, air passengers can expect business as usual at Helsinki Airport with little disruption to regular air traffic, according to airport operator Finavia. It added however that passengers should reserve ample time for check-in and boarding. In addition, airport security will be tighter than usual and there may be special arrangements in place. Furthermore, access to the airport may be restricted during the presidential visits, the authority says. Meanwhile the Finnish Border Guard said that it will be engaging in additional checks for the period that the visiting presidents are in Finland, particularly at Helsinki Airport. They warned that air passengers should count on this process adding to time spent at the airport. The outfit said that it has already begun closer scrutiny of persons under suspicion who may be entering the country and will also be keeping a closer eye on EU residents. Such checks will rely on intelligence gathered by border and police officials. The Border Guard said that it may step up monitoring of Finnish borders in the days leading up to the Trump-Putin meeting and will focus attention on key border entry points such as Helsinki Airport and the country's main harbours. Although EU citizens are not usually subjected to monitoring as they move within the Schengen area, passport checks have in the past been introduced during special events such as the World Athletics Championships in Helsinki in 2005. Homeowners adding to accommodation stock. Helsinki’s marketing chief Vappu Mänty said that the city currently offers some 10,000 hotel rooms –up to 15,000 if the entire metropolitan area is considered. She noted that Lahti, 100 km to the north, could provide another 2,000 rooms. “But the hotel situation is constantly changing,” she noted. She said that many Helsinki residents have sought to cash in on the opportunity presented by the prospect of throngs of visitors and are offering their homes as accommodation on the short-term rental service Airbnb. Helsinki Marketing expects to see more homes come on the online service as the summit draws closer, because demand is currently so high. "It is gratifying that the urban residents getting involved and welcoming people from all over the world to Helsinki,” she remarked. On Thursday, there were 253 Helsinki flats available on Airbnb but just 16 percent were available between 15-17 July. On the accommodation brokerage site Booking.com, 152 overnight stays were available in Helsinki. Additionally, many of the city’s major hotels are already fully booked. Hotel prices likely to spike. Scandic Hotels business manager Christian Borg told Yle that he could not comment on whether or not the chain’s Helsinki hotels were booked to capacity during the time of the summit. But he did acknowledge that demand was high. Borg noted that demand for hotel rooms is typically high in mid-July when foreign and domestic tourists spend time in Helsinki. However he said he believed that people would still be able to find rooms around the time of the summit. But he pointed out that consumers looking to book stays around the time of the summit might have to dig deeper into their pockets: prices are already a bit higher for the days of the summit than in the following week.